Kotaro Nagano z Japonii zdobył pierwszą nagrodę ($ 25.000) w 2. Międzynarodowym Konkursie Chopinowskim w Canberze, który zakończył sie 21 września. Drugie miejsce w konkursie zdobyła Daria Kameneva z Rosji i $10.000. Z kolei amerykańsko-ukraińska pianistka Elina Akselrud zajęła w ocenie jury trzecie miejsce i dostała nagrodę $ 5.000. Pierwsza nagroda ufundowana była przez Fundację Pratt i wręczona została przez Jeanne Pratt AC. Drugą nagrodę ufundowało stowarzyszenie Friends of Chopin. Wręczona została laureatce przez przewodniczącą stowarzyszenia, Wandę Horky. Nagrodę zdobywczyni trzeciego miejsca przyznała ambasada RP w Canberze , którą wręczył laureatce Paweł Milewski, ambasador RP w Australii. Zwycięzca konkursu Kotaro Nagano zdobył także Nagrodę Publiczności w wysokości 1.500 dolarów przyznaną z kolei przez Radę Organizacji Polskich w ACT. The Australian International Chopin Piano Competition is a legacy of the Chopin Bicentennial Year 2010 when in that year the Embassy of the Republic of Poland in Canberra, the ANU School of Music and the Friends of Chopin Australia came together to establish the 1st edition for 2011 with the vision to return to the poetic lyricism of Chopin’s own time and to play Chopin as he would have played. 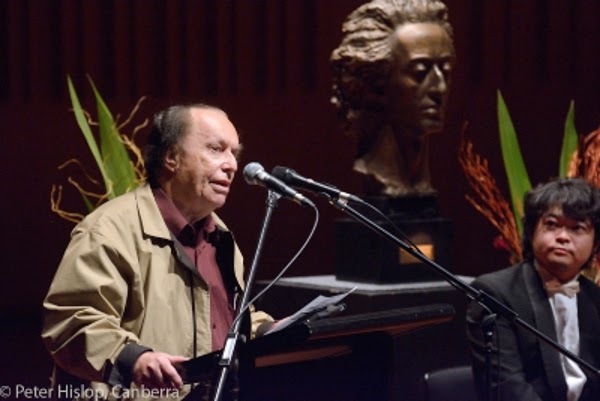 The jury Chairperson for the 2nd Australian International Chopin Piano Competition, 15-21 September 2014, Emeritus Professor Larry Sitsky AM said they were after someone who could capture the romantic spirit of the 19th century, the feeling of freedom that is expressive, individual and above all original. Sixteen competitors were selected from a very strong and large field of Australian and international applications, however this was reduced to eleven comptitors for the starting lineup, due to normal attrition and injuries. They represented Canada, China, Japan, Korea, Poland, Russia, Taiwan, Ukraine/USA and Australia. The largest number of competitors came from Poland with three, and Australia with two. The largest national group of four was of Polish descent, which indicates the important link Chopin is making between Poland and Australia. The competition was divided into three sections, the Preliminaries, the Semi-finals and the Finals. Monday the 15 September included competitor registration and orientation with an opening reception for invited guests, partners and sponsors, jury, competitors and host families. 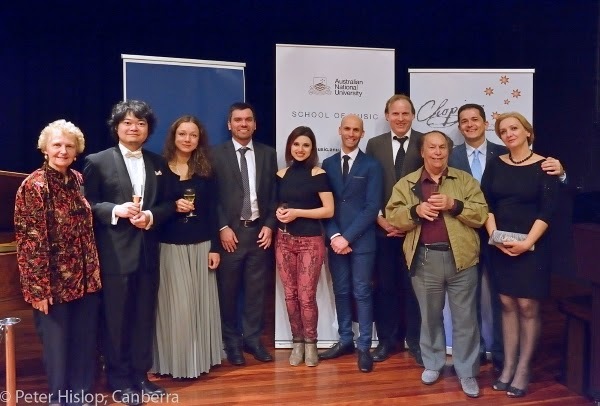 Speeches were given by the three partners of the competition – Professor Peter Tregear, Director of the ANU School of Music, Wanda Horky, President, Friends of Chopin Australia and His Excellency Ambassador Mr Pawel Milewski, Embassy of the Republic of Poland in Canberra. Also making speeches were the Artistic Director, Maciej Pawela and the chair of the jury Chair Emeritus Professor Larry Sitsky AM. The Preliminaries on Tuesday and Wednesday, 16-17 September, required all competitors to prepare two programs of 20 minutes. Music to be included was by Chopin, Debussy, Szymanowski. Debussy and Szymanowski were composers who were deeply influenced by Chopin. Competitors were grateful for these two opportunities to show off their unique talents. The successful Semi-finalists were Elina Akselrud, Daria Kameneva, Lukasz Krupinski, Kotaro Nagano, Piotr Nowak and Maciej Wota. Thursday the 18 September was a non-competition day with competitors practising for their Semi-finals. Music could be heard coming out of the various rooms throughout the School, which entertained everyone on the Information Desk. 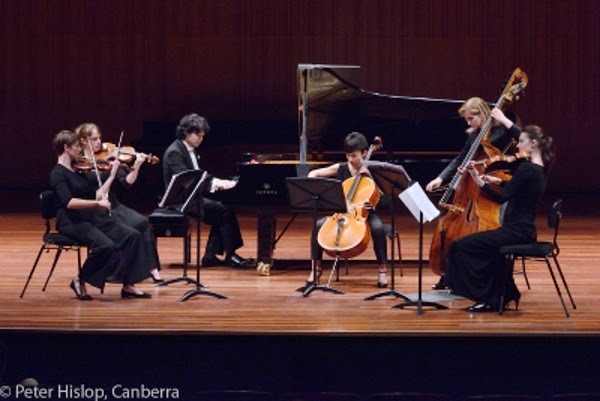 There was a Youth Masterclass where talented students under 16 years from ANU’s Open School of Music Program performed a repertoire that was observed and assessed by some members of the international jury. This vital feedback assists these students to dramatically improve their technique and interpretation in music performance. The Semi-finals held on Friday 19 September required a 40 minute program with some choice between a Sonata, Polonaise, the Andante Spianato et Grande Polonaise Brilliante, and an Australian work – either a Sonata by Vine or Bozicevic’s Dan Gnejva which was the winning composition for this second edition. Dan Gnejva or Day of Wrath is based on Chopin’s Prelude in A minor, Op.28 No.2. The playing was exceptional yet only three competitors advanced to the Finals they being Elina Akselrud, Daria Kameneva and Kotaro Nagano, the unsuccessful three being the three young men from Poland, Lukasz Krupinski, Piotr Nowak and Maciej Wota. Saturday the 20 September was devoted to the Pleyel, Chopin’s preferred piano, of which the School of Music has an 1847 concert model grand. The Pleyel Day as it was titled, was in two sessions, a lecture and a recital. The lecture included an introduction to the Pleyel piano by Dr Erin Helyard, an early music specialist at the ANU School of Music, followed by an interesting lecture by Dr Gemma Betros, a historian at the ANU, on Ignace Pleyel as composer, music publisher and piano manufacturer. The lecture was interspersed with performances of excerpts from one of Pleyel’s string quartets performed by the Enigma String Quartet, as well as some songs of Chopin performed by Maciej Pawela and Helena Mamic, as well as some short pieces for guitar played by Ciaran Edwards-McKeown. The recital was introduced by Dr. Stephen Loy who spoke about Chopin’s Preludes before introducing Dr. Wojciech Switala who performed a selection of Preludes and Mazurkas of Chopin on the Pleyel to give the audience an authentic 19th century soundscape known to Chopin. This event had a full house and was one of the highlights of the week. This event was partly sponsored by the Friends of Chopin Australia. The Finals held on Sunday 21 September was a tour de force with the three finalists being accompanied by the Enigma String Quartet supplemented by a guest double bass. Elina Akselrud and Kotaro Nagano performed Chopin’s Piano Concert No.1 in E minor, op.11 and Daria Kameneva Chopin’s Piano Concerto No.2 in F minor, op.21. The chamber arrangements of the piano concertos were a perfect accompaniment and carried the audience away to sublime heights. Kotaro Nagano (Japan) won the 1st prize of $25,000 awarded by the Pratt Foundation and presented by Ms Jeanne Pratt AC. Daria Kameneva (Russia) won the 2nd prize of $10,000 awarded by the Friends of Chopin Australia which was presented by its President, Wanda Horky. Elina Akselrud (Ukraine/USA) won 3rd prize $5,000 awarded by the Embassy of the Republic of Poland in Canberra and presented by H.E. Pawel Milewski, Ambassador of the Republic of Poland in Australia. Kotaro Nagano also won the People’s Choice Prize of $1,500 awarded by the Council of Polish Organisations in the ACT and presented by its Vice-President, Eta Rogoyska. These prizes were presented at a Prize Giving Ceremony, which saw the very worthy laureates receive additional gifts, also given to the international jury. After the Ceremony the three laureates gave a Prize Winners Concert with Elina (3rd) and Daria (2nd) performing solo repertoire and Kotaro (1st) repeating his Piano Concerto No.1 in E minor with the Enigma String Quartet with double bass. Julian Day, ABC Classic FM presenter was the distinguished Master of Ceremonies for the Finals, Prize Giving Ceremony and the Prize Winners Concert on Sunday. He made quite an impression on everyone. The Semi-finals, Finals and Prize Winners Concert in Llewellyn Hall were live-streamed and video footage will be available on the websites of the ANU School of Music and the Friends of Chopin Australia. The Friends of Chopin Australia as a partner had many responsibilities. Apart from awarding the 2nd Prize of $10,000 it was responsible for finding host families for all the competitors who generously shared their homes and hearts with the pianists. Their hospitality was the heart to the successful competition because it meant the competitors gave the best of themselves, resulting in outstanding performances which thrilled the audience and made life quite difficult for the jury. Many congratulations to our wonderful hosts who have now forged lasting friendships with the competitors and the Friends. The Friends also partly funded the other guest appearances and incidentals. The Friends also ran an Information Desk from the foyer of the School throughout the week of the competition. This Desk was the communication hub for the competitors, jurors, the ANU School of Music staff, host families and the public and was staffed by our many passionate volunteers – Iwona Hawke, Barbara Jansson, Danusia Olejniczak, Sally Williams, Jeny Young -- and committee members Malgorzata Anczewska, Dr Jolanta Gallagher, Wanda Horky, Rosanna Horn, Lydia Nichols and Eta Rogoyska. It provided important competitor support through mentoring and the many cups of tea, biscuits and other goodies, from the spacious AtheNaeUm Room, adjacent to the Information Desk that also became a pleasant and welcomed social hub for host families, visiting artists and the jury – in fact for everyone! The Friends were responsible for competitor and door ushering during the two rounds of Preliminaries ensuring competitors were not disturbed in any way. With the competition moving into Llewellyn Hall for the Semi-finals and Finals the Friends were responsible for stage management, jury and MC support and ensuring the smooth running of these two major events which were live-streamed around the world. It had the excellent cooperation of the School’s technical staff to make it all work efficiently and without any hiccups. However none of the accolades regarding the wonderful planning, smooth and efficient running of the competition, the personal competitor support and the Competition’s great success would have been possible without Benjamin James, the Vice-President of the Friends of Chopin Australia. He stands out because of his enormous contribution to the Competition and the Friends. He was invited by the ANU School of Music to be its Liaison Officer between all the partners and this role became by necessity that of the Competition’s General Manager during the Competition week. 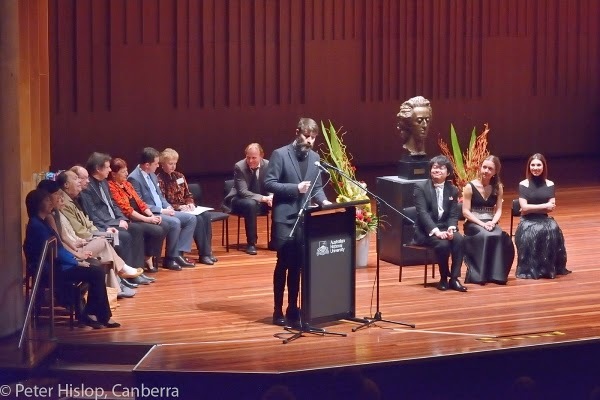 There was virtually no area of the competition that Ben was not intimately involved in helping to make a success, supporting both the ANU School of Music and the Artistic Director in the lead up to the Competition and during the Competition week. His conduct was outstanding; professional and always with great warmth considering he was working frequently under extreme pressure. It is the calibre of Ben that there has been nothing but praise from all partners, competitors, artists and those behind the scenes. Currently a professional project manager for the Australian government, and with a career within the Australian Public Service that spans international relations, development and reform, he undertook this venture on a purely voluntary basis, which is lucky because the competition certainly couldn’t afford him if they had to pay for him. 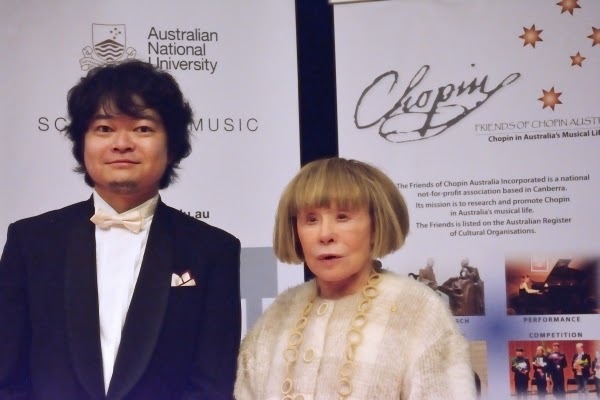 However, it shows his total commitment to and passion for the Australian International Chopin Piano Competition and to the Friends of Chopin Australia that he worked so tirelessly and behind the scenes. Ben sincere congratulations and many thanks! 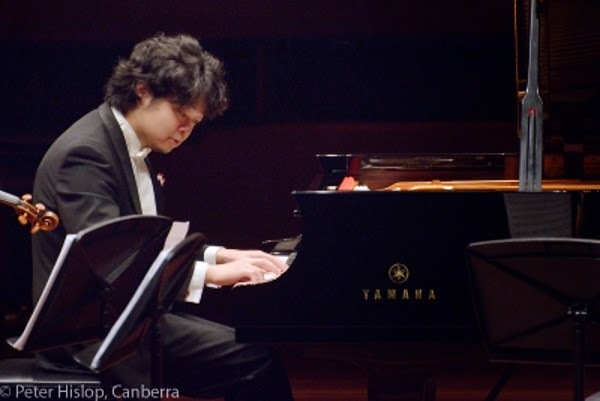 Lastly, the Friends of Chopin Australia thank everyone in Canberra and the rest of Australia for their support and attendance because by making this competition yours it became an unqualified success! All partners are looking forward to the 3rd edition sometime in the near future. Watch this space for dates and announcements! Jeanne Pratt AC and the Pratt Foundation, Christine Goode, Yamaha Australia, Theme & Variations Piano Services. Bob and Jenny Nairn, Karen Dahl, Lydia and Greg Hockings, Arn Sprogis and Margot Woods including another seven families. H.E. Ambassador Mr Pawel Milewski and Deputy Head of Mission Mr Piotr Buszta. Tony Henshaw, Marilyn Higgins, Terry Neeman and the Committee of the Friends of the School of Music and those who came forward as host families. The Friends also financially sponsored the Competition. Blum Foundation managed by ANZ Trustees, Council of Polish Organisations in the ACT Inc., particularly Andrew Alwast, President, the Polish Community Council of Australia, Barbara Alwast (White Eagle Club), Aleksander Gancarz, Eugene Bajkowski, Aleksandra Plazinska, Wanda Kiljanska-Calka (Kronika Polonii, ACT), Eva Roslan, Ernestyna Skurjat-Kozek (Puls Polonii), Krzysztof Bajkowski (Bumerang Polski), Anna Sadurska (SBS Polish Radio), Marianna and Bronek Lacek, Olivia Urbaniak and family. Jim Mooney and staff at Artsound FM, Chris Leslie, Peter Hislop, Lindy Reksten, Fine Music 102.5 FM, ArtsACT, Poetry in Flowers, Sam Wong AM. Gratulacje dla laureatow i organizatorów Konkursu!